Available from Moreno Global Plastics , Minibin 8060 vented collapsible bins are especially designed for use in the fresh produce industry. 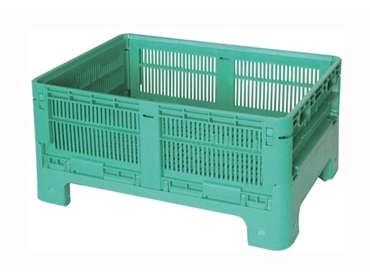 These collapsible bins weigh 11kg are capable of handling up to 110 litres of produce up to a weight of 60kg. Minibin 8060 produce bins have outer dimension measurements of 800mm x 600mm x 395mm (207mm when folded) and inner dimensions of 745m x 545mm x 250mm. Available with four feet, these vented collapsible bins can be supplied with personalised hot stamping and card holder, which is mounted directly onto the exterior of the bin. Minibin vented collapsible bin are supplied light grey colour as standard, however, other colours are available but conditions do apply.